The Northeast States Emergency Consortium (NESEC) is funded by the Department of Homeland Security/Federal Emergency Management Agency (FEMA) to provide no-cost assistance to help local, state, regional and other critical and essential organizations in the Northeast understand and mitigate their risk from natural hazards and become more resilient. Using the FEMA program Hazus and Esri ArcMap, NESEC can model the impacts of earthquakes, hurricanes, floods and coastal storm surge in your jurisdiction. There is no cost to the requesting city, town or state. Requests from private entities will be evaluated on a very limited case-by-case basis depending on the critical and essential nature of the organization. In no cases will support be provided to private consulting firms. Mapping critical and essential facilities over hazard-impacted areas can help you visualize damage to your hospitals, fire and police stations, EOC, shelters, etc. NESEC will provide selected entities with easy-to-understand information or report covering the economic impacts of any given earthquake, hurricane, or flood affecting your community. The reports include hazard maps, dollar damage estimates, shelter requirements, debris estimates, critical infrastructure and facility functionality and much much more. This information or report can be an important tool for community resiliency, hazard mitigation, emergency planning and operations, training exercises and more. NESEC may also create a map of critical facilities and other primary infrastructure within your community/region, based on available and user-provided data. NESEC may gather available aerial photography and satellite imagery and compile it into an orthophoto base map of your area. Mapping critical and essential facilities over hazard impacted areas can help you visualize damage to your hospitals, fire and police stations, EOC, shelters, etc. and take actions to make your community more resilient. 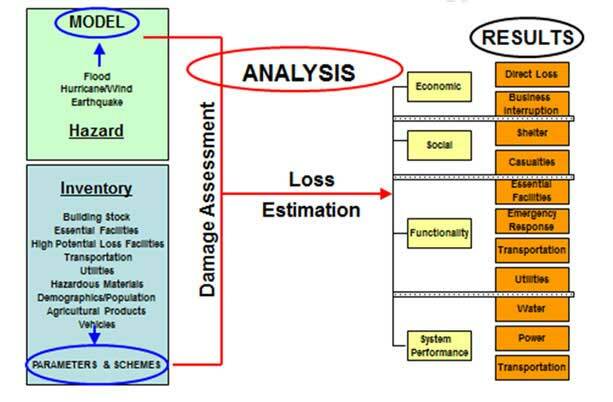 The reports include hazard maps, dollar damage estimates, shelter requirements, debris estimates, critical infrastructure and facility functionality and much much more. NESEC may provide technical support where necessary to help you incorporate GIS and digital imagery into your EOC. We may also provide you with some GIS base maps to help your new GIS center get started. 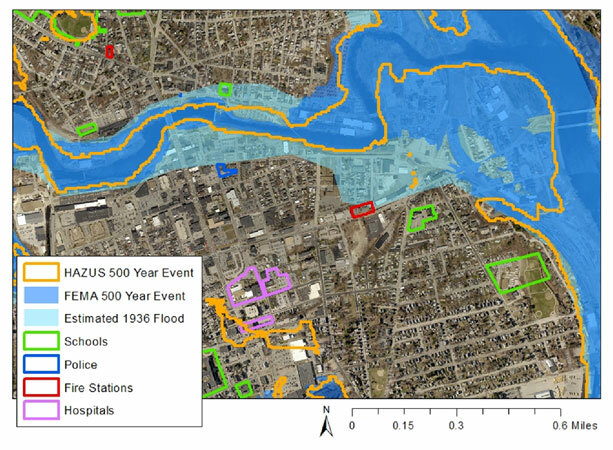 NESEC has provided hazard risk assessments to the City of Boston MA, Nashua NH, Ipswich, MA, FEMA Region 1, the states of Maine, Connecticut, the Commonwealth of Massachusetts and others. If your agency or organization is interested in obtaining NESEC’s assistance with Multi-Hazard Risk Mapping, please click on the link below and complete the simple application. NESEC will review applications as they are received and a conference call will be set up with each eligible applicant to discuss the details of your requested assistance. Your application will then be evaluated based on current funding and priorities, the content of the request and other relevant factors such as levels of hazard risk and mitigation capacity in the affected area. NESEC will coordinate the final approval of all applications through your State Office of Emergency Management to ensure consistency with state policy, plans, and programs. All eligible applicants will be notified as to the whether their request for assistance has been approved and given a proposed start date.